What an embarrassment of a game. 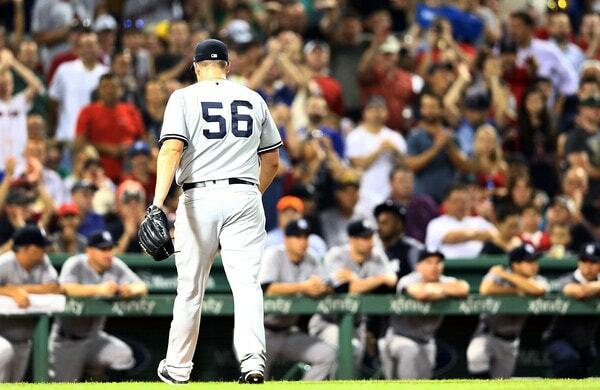 The Yankees were out-hit, out-pitched, out-defended, and out-managed in Thursday night’s series opener at Fenway Park. Inferior in every way and totally out-classed. The final score was 15-7 and it could’ve been so much worse. Thursday’s game started so well. Aaron Hicks reached on an error, Giancarlo Stanton almost scalped Brian Johnson with a line drive single, and Didi Gregorius whacked a three-run home run into the bullpen. Ten pitches into the game, the Yankees were up 3-0. Hicks added a solo home run in the second — it was his fourth homer in his last six plate appearances against the Red Sox — for a 4-0 lead. CC Sabathia, however, was fully intent on giving it all back. He stranded a leadoff walk in the first, walked in a run but otherwise stranded the bases loaded in the second, then allowed a solo homer but otherwise stranded runners at second and third in the third. Three innings, seven baserunners, two runs, 77 pitches. And it could’ve been a heck of a lot worse. The Red Sox really let Sabathia off the hook all three innings, especially the second and third. (1) You could tell Jonathan Holder was in trouble right away. Five-pitch leadoff walk to Bradley and not one of the four balls was close to the plate. Holder is usually very stingy with the walks (4.1% coming into the game), but the only competitive pitch Bradley saw was the 3-0 get-me-over fastball he took because duh. (2) This was embarrassing. Second and third, no outs, and Holder gets a little comebacker right to him. Exactly what he needed. Rather than run at the runner like you’re taught in high school, Holder panicked, threw immediately to third, and that allowed Bradley to scamper home. Miguel Andujar deserves credit for making the play at the plate as close as it was. Just another example of the 2018 Yankees looking like they have no idea what the hell they’re doing on the most basic of basic plays. 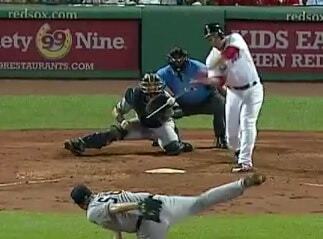 … and Pearce hit it over the Green Monster, which is exactly what a good hitter should’ve done with a pitch like that. The 4-3 lead became a 6-4 deficit. Four batters, zero outs, lots of mistake pitches. It is unfathomable Holder was allowed to remain in the game after that home run. Boone was asleep at the wheel. Things were going awry and he didn’t know what to do. (4) At this point the Yankees had thrown 102 pitches to get nine outs. I’m not joking. 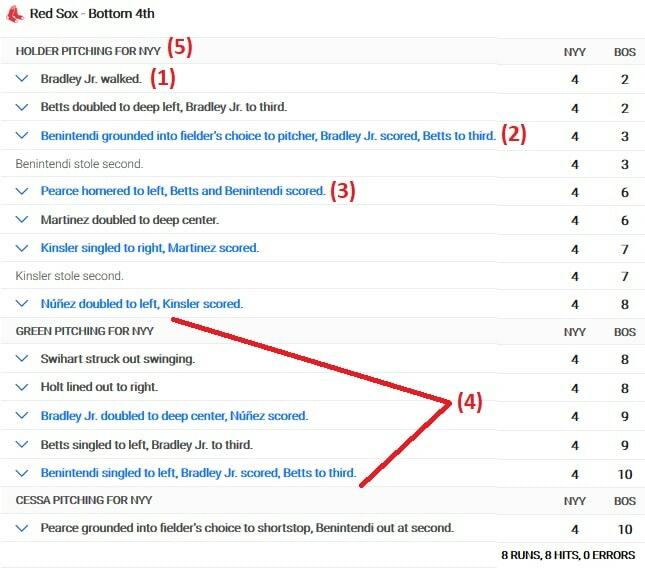 Holder faced seven batters — including three after Pearce’s go-ahead home run — and did not retire a single one. Unless I Play Indexed wrong, which is a definite possibility, Holder is only the third Yankee ever to face seven batters and record zero outs. Bob Kammeyer did it in 1979 and Fred Talbot did it in 1967. Anyway, formerly shutdown reliever Chad Green came in, got two quick outs and had a chance to limit the damage. Instead, three straight two-out hits to score two more runs. Green has been squared up an awful lot lately. He has no business in important spots at the moment. (5) Really glad the Yankees salary dumped Adam Warren, you guys. This was the perfect Warren game. Two-run lead and the starter out after three innings? That’s an Adam Warren spot, and he gives you two innings, maaaybe three if his pitch count low. Instead, the Yankees gave him away for $1.25M in international bonus money — they got $1.5M for Caleb Frare, a 25-year-old reliever who hadn’t pitched at Triple-A until days before the trade — and they gave him to another AL contender to boot. I’m not saying Warren would’ve turned this into a win. Of course not. I’m just saying the decision to salary dump — and that’s exactly what it was, a salary dump to stay under the $197M luxury tax threshold — a reliable multi-inning reliever was incredibly stupid. A team trying to win a division and trying to win a World Series doesn’t do that. Boston’s eight-run fourth inning turned a 4-2 lead into a 10-4 deficit. 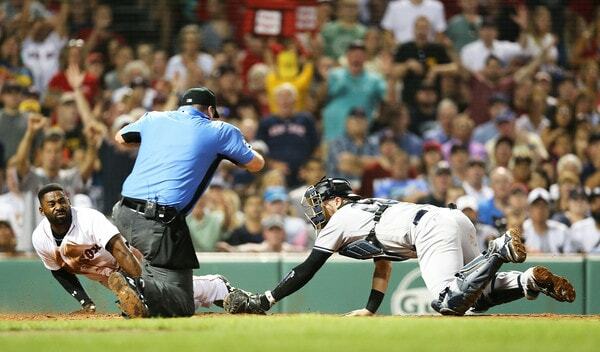 Andujar took his time on a routine grounder and Eduardo Nunez beat it out for an infield single. Hicks didn’t back up left field on a ball hit off the Green Monster, allowing the runner to take the extra base while Brett Gardner ran after it. Holder threw behind Bradley on that comebacker in the fourth inning. Greg Bird had a ground ball hit right at him with the bases loaded and one out, he looked in every direction, yet never threw or took a step toward first. Everyone was safe. This keeps happening and it’s been happening all season, and it falls on the coaching staff. It falls on infield coach Carlos Mendoza, on outfield coach Reggie Willits, and it falls on Boone. The buck stops with the manager. Sabathia got hit by a comebacker and airmailed the throw to first for an error. It happens. It’s a physical mistake. I can live with those. They’re inevitable. But players throwing to the wrong bases, players not being where they should be, players not knowing what to do on a specific play? That’s garbage. Unacceptable for a contender, especially this deep into the season. The Yankees looked unprepared — that’s the only way to describe it, unprepared — far too often, and it’s gone on too long. It’s a failure by the coaching staff and a failure by Boone. Play this sloppy for this long and it’s on them. It’s not just the players. Shout out to Luis Cessa for sparing the rest of the bullpen. He did allow five runs in his 3.2 innings, but who the hell cares. The 3.2 innings matter more than the five runs. The problem now is Cessa was Saturday’s scheduled starter, so the Yankees have to find someone to fill-in. Sonny Gray on two days rest after throwing 57 pitches Wednesday? Nah. Chance Adams lines up to pitch that day for Triple-A Scranton. Maybe it’ll be him. We’ll see. 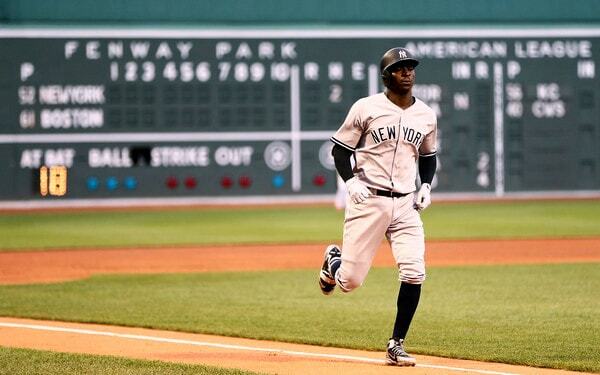 The Yankees added three runs after the Red Sox blew the game open in the fourth. Gregorius hit a solo homer in the fifth, Stanton hit a solo homer in the seventh, and Stanton had a sacrifice fly in the ninth. Hicks, Stanton, and Didi went a combined 5 for 11 with a walk and four homers. The rest of the lineup went 2-for-21 (.095) with a walk. I mean, they scored seven runs. How many more do you need? This four-game series is just getting started and I’m not sure that’s a good thing. The Yankees and Red Sox will meet up again for the second game Friday night. Luis Severino and Rick Porcello are the scheduled starting pitchers. Hope we see good Sevy for the first time in like a month.